Week 7 – If you don’t listen to this person, your dreams may never see the light of day. Have you ever thought about visiting Alaska? Do you love the sea? Have a dream to become a Mover & Shaker in your field? Well, why not combine these desires and join me on a cruise this summer . Get all the details here. If you don’t listen to this person, your dreams may never see the light of day. We’re buried under four feet of snow and there’s more on the way. For the first time in my Northeastern life, I’m seriously considering moving someplace warm for winter. Anyone need some extra snow? This morning I decided to forgo the gym for my new exercise routine: Cardio shoveling . As the next storm moves in, it’s become necessary for us to remove the snow from our deck to avoid a disaster. So I put on my big puffy coat, my fleece-lined mittens, and my warm wool socks, and I set out to clear the decks! After three shovelfuls I stopped and stared at the job ahead. “This space is the size of Rhode Island,” I told myself. Okay, the deck’s not really that big. I started in again and stopped several more times. We’ll never get this cleared before the next storm. My back is going to break. I’m too old for this. That last thought made me hold up and regroup. After reading Chris Northrup’s new book, Goddesses Never Age where she provides such a compelling case for how our mental habits play a BIG role in our longevity, I knew I needed to knock it off. If I were going to complete my part of this snow removal project, I’d have to make it a physical and mental workout. First, I lined up support. I looked for the three concrete statues of strong women I keep on my deck – Mother Mary, Kuan Yin, and a Guardian Angel – all completely covered in snow, and I shoveled them free. Don’t let the concrete fool you. These gals are spiritually alive and ready for action! My body was made for shoveling. I love my strong back and arms. My lungs appreciate this fresh air. I’m so grateful for this spacious deck. The more I shovel, the younger I feel. I also did something loving for myself: I took frequent breaks. Shovel, shovel, shovel, stop and take in the beauty. Rather than rush to get the job done (something I’ve been doing nearly all my life), I stayed present to the experience and actually started to enjoy the process. I also took care of my body. I balanced lifting heavy loads of snow with light ones. I switched arms and sides so my torso got an even workout. Oh, and I started singing Christmas songs (I highly recommend this idea). After ninety minutes, I stood up, sweating and smiling, breathing in the silent air. Snow has a beautiful way of quieting the world. As I looked at the space I’d created, I thought about how the process of accomplishing this goal was similar to the process of achieving any dream. Long ago, when I set out to write my first book, it felt big and heavy and insurmountable. Like producing a dictionary. I started and stopped numerous times under the weight of it all because I kept telling myself I couldn’t do it. I wasn’t equipped. Back then, I said I was too young. But some strong, persistent part of me knew otherwise and she kept me in the game. She gave me the courage and hope I needed to keep putting one foot in front of the other. One sentence at a time. Sometimes one word. She also opened my heart and mind to staunch support – friends who believed in me and gave me their confidence when I couldn’t find my own. We all have that part inside. Every one of us. Whether you’re writing a book, looking for love, starting a family, building a home, or embarking on a new phase of life, you need to find that part and use it. 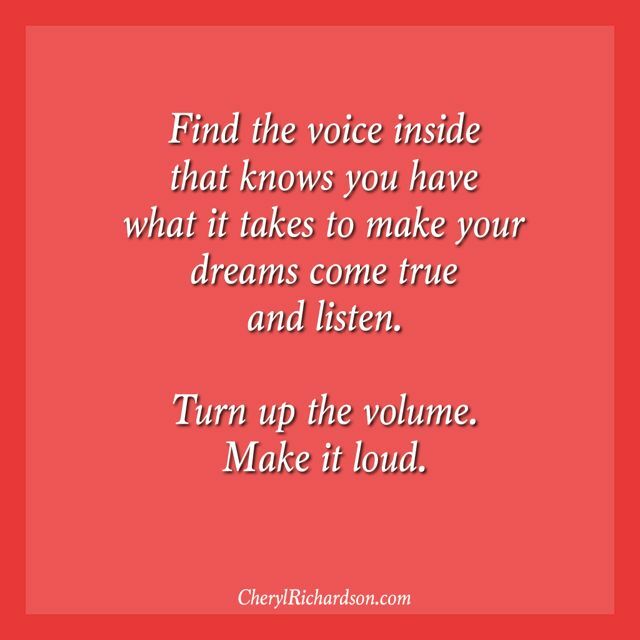 It’s the inner voice that knows you have what it takes to start, stop, get up again, and finish. Turn up the volume on that voice. Because it’s what makes dreams (and snow removal projects) come true . Here’s a great song to sing while working on a tough project. Check it out here.